Film about the Palio, the oldest horse race in the world, which turns the Italian city of Siena into a high-stakes battleground of strategy, intrigue and simmering machismo. 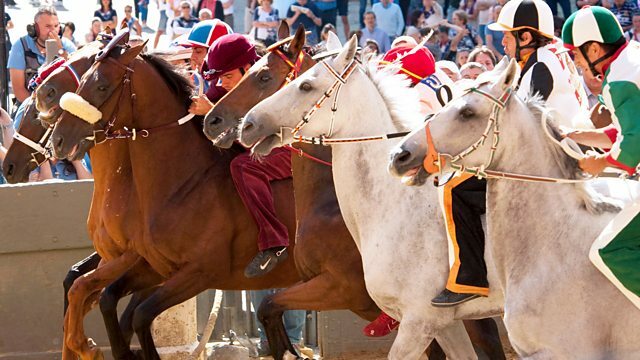 The Palio is the oldest horse race in the world, and turns the Italian city of Siena into a high-stakes battleground of strategy, intrigue and simmering machismo. In the eye of the storm stand the jockeys - adored if they succeed, despised if they fail. This film follows the legendary maestro Gigi Bruschelli, winner of 13 races and master of the intrigues that surround the Palio, and his former protégé Giovanni Atzeni, a handsome young contender driven by a fearless passion to become number one. It exposes the notoriously closed world of this ancient race and the larger-than-life personalities of those involved in an epic and cinematic tale of Italian life in microcosm. What is more important, story or character? In this film I started with just the characters (the jockeys) and their point of view of the Palio. By the end of the shoot we realized we had not only a group of diverse and entertaining characters but also a classic epic story. A film works when both characters and storylines are strong. I grew up near Siena and wanted to make a film on the Palio as my graduation film from film school. I started researching and realized it was too big a subject and waited till I had three feature lengths under my belt before embracing the Palio full heartedly. Once I clicked my angle was going to be the jockeys, I found it easy to focus within the chaos of this spectacle. Two years from start to finish. I learned how satisfying it is to make a classic narrative story. In documentaries, this comes out of a fortuitous alchemy of crew talent, the relationship with your characters and following your deepest instinct while filming real time events. Amazingly, all over the world people seem to really enjoy being initiated into the arcane world of the Palio, with its layers of intrigue, subterfuge, beauty and tradition. Some are drawn in by the action flavour of the film, others to the ethnographic side. Fiction films inspire me more than documentaries; Sergio Leone’s ‘spaghetti westerns’, Sorrentino’s “Il Divo” and Fellini’s “Roma” and “Amarcord”. I’d rather read a book. I only go online for email and instagram. 14th Century Italian author Giovanni Boccaccio. Always leave a door open. The ‘Comune’ of Siena, the city council. Showcasing the very best in fascinating feature length documentaries.